Rewards Canada: Are the American Express Cobalt Card category multipliers available globally? A question that has been posed to me about the new American Express Cobalt Card repeatedly via email, social media and in comments is about the category multiplier bonuses being available on purchases outside of Canada as we are the only ones reporting that they actually are. 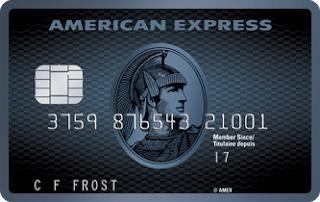 I posed this question numerous times to American Express in the months leading up to the launch of the card. On every occasion I was told it will be global so long as the merchant you shop has a proper merchant code for that multiplier. I was assured that even during Amex's own pre-launch testing of the card at properly coded merchants outside of Canada showed up with the correct multiplier bonus. So when the card launched last week and they added the in Canada terminology to the multipliers I reached out immediately to American Express to ask them once again about this as up until the 25th we were going on the basis of it being global. I was told they added the in Canada terminology on the Cobalt pages because American Express can only control what category Canadian merchants fall into. Think about, Amex Canada can set the merchant code for a pizza joint in Ottawa but they can't for a pizza joint in Cincinnati, that's up to Amex US and there could be some reason the latter place doesn't code as dining. So if you have the Cobalt Card and travel to Cincinnati, buy pizza from the place you can't call Amex Canada about it not coding properly. If it happened at the Ottawa joint you could ask Amex about it, and they could change the merchant code of the place. In fact I asked them about a similar situation where Canalta Hotels, yes a hotel chain here in Canada, was not earning 2x points on my Gold Rewards card and we are now hoping their merchant code is changed. That leads us into the Gold Rewards Card and some have used this an example because it has the in Canada terminology for its multipliers other than travel. And yes this is the case with the Gold Rewards Card in that those certain multipliers are only available in Canada. I brought this up in our discussions and was assured it's not the case the Cobalt Card. To make a long story short, as long as a merchant codes into a multiplier category it's doesn't matter where in the world you use your Cobalt Card, you'll get those extra points. However if one of those locations outside of Canada doesn't, you don't have any recourse and that is why the Cobalt Card has emphasis on eligible spend in Canada.